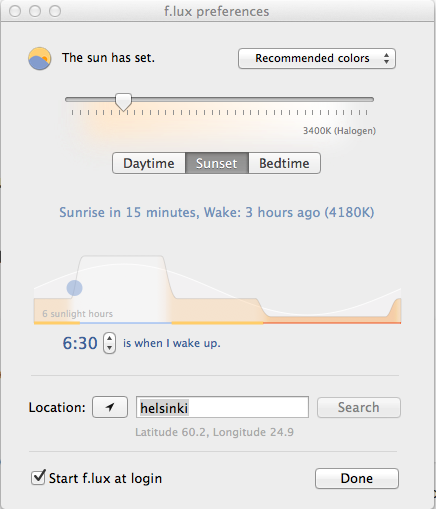 I've been now using my computer for an hour, and f.lux is still "sleeping". I would like to see white light in the morning to wake up! Couldn't agree more. The beginnin and end of preferred "daytime" should be customized. Or maybe there could be another buttons in addition to "when i wake up": "when i go to sleep". Instead of entering a city/town/village name; have you tried entering 'your' latitude and longitude coordinates? In the newest build (39.94) there is a "far from the equator" preset that may help.